Throughout the years, we have received a few wedding press coverages in different newspapers, magazines as well as online features! We're so thrilled to be included in this list of Best Floral Designers in Quebec & Canada! THANK YOU! What a great way to start spring! For this natural and organic wedding creative, A Timeless Celebration headed outdoors. White and green florals were paired with gold decor throughout, and to think outside the box for the ceremony, a circular arch was selected alongside slate planters to line the aisle. From the free-flowing ivy along the mantelpiece to the boxed stationery placed atop a bed of moss, we don’t know which decor element is our fav! Top 3 wedding planner in Montreal 2019! 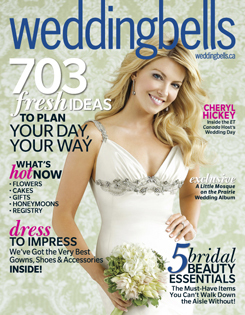 We are so thrilled for being handpicked to be one of the Top 3 Best Rated Wedding Planner in Montreal! We took on the challenge and went through a 50-point inspection! Thank you to all past and present clients who’ve brought us far and to more unimaginable places and recognitions! Cheers to 2019! Named Top 30 Event Planners in Canada 2019! “In this post you'll find the best Canadian Party Planners we know today. … That's why we decided to give a shout out to the best Party Planners we know and to help you with your next event. Check out the other top event planners in Canada you need to follow in 2019! We are so honoured to have been published in the Elegant Wedding Magazine! More of an honour to have created the bridal party bouquets & centerpieces for Bridget & Behrouz’s Old Montreal wedding at the Nelligan Hotel. All the beautiful photos were captured by the talented Lana Nimmons Photography! For Jessica and Brad, an outdoor wedding with a lakeside ceremony was something they always wanted. When they discovered the L’Oasis De L’ile, the couple knew they had found their prefect wedding location. It’s an honour to be asked to be a bridesmaid, but what does being a bridesmaid really mean? 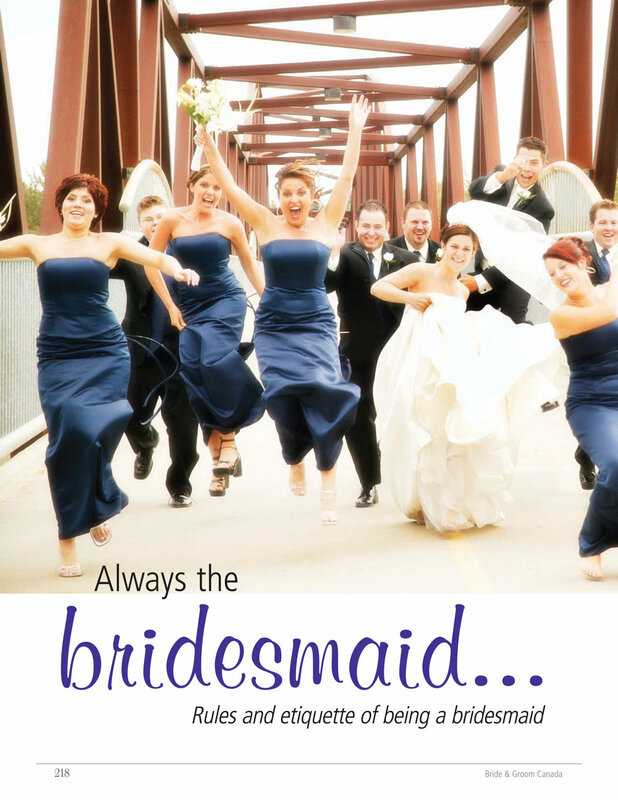 To be at the bride’s beck and call is only part of the bridesmaid’s prenuptial protocol. Most brides also have certain expectations when it comes to how their bridesmaids will look, including their dress, shoes, hair, makeup, and even accessories. There’s the matter of throwing the bride her customary pre-wedding celebrations, like a bridal shower and stagette, as well as the monetary obligations that come with these events. Caryn Lim studied fine arts in college and then went into Education at McGill University in Montreal, Quebec. Upon graduation she started her wedding business immediately. In 2003, she was approached by three different couples for help with their wedding. She says, “They saw something in me that I didn’t know I had and to this day, I’m forever grateful to them for helping me discover the talents in me!” She had never done a wedding before, but decided to take them on. Read on to see where those three weddings have taken her to this day! DIY INVITATIONS FEATURED ON BRIDE.CA: EDITOR’S PICK! 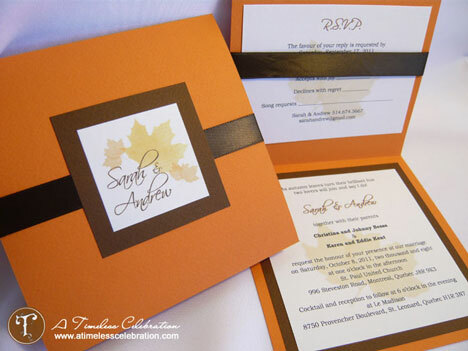 We review and experience hundreds of wedding services every week; very few have ever impressed us so thoroughly and so immediately, as Montréal-based DIY Wedding Invitations by Envelopments. Quality & value, style, presentation & attention to detail, enthusiasm, professionalism & great customer service... our kudos to them! Many find that having their initials embroidered on their runner will add personality to the event, whereas others add their personal style through embroidered embellishments or through colour. Although white or ivory are traditionally used, more and more couples are choosing to have aisle runners in a colour of their choice. For example, couples of Chinese descent often use red. 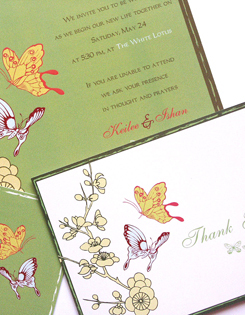 For intricate handmade invitations, Caryn Lim at A Timeless Celebration, atimelesscelebration.com, is your girl. Lim discovered her passion for weddings while helping friends plan their nuptials. Fast forward several years and she has created a successful business. While ceremony programs might not be necessary for a small beach wedding or quick ceremony at City Hall, it’s nice to keep guests in-the-know and provide them with a glimpse into the day’s events. When creating your program, remember the five Ds to ensure perfection! From scrolls to panels to single sheets, there are many options available for program designs. “I’ve been getting a lot of orders for program fans with a small ribbon on them,” says Caryn Lim, owner of Montreal-based CLP Invitations (clpinvitations.cceasy.com). Whichever you choose, opt for acid-free paper because it won’t deteriorate in a scrapbook over time. When it comes to information, not every detail of your big day will be of interest to guests. Sasha Brijmohan of Woodbridge, Ontario’s Pretty Paper recommends printing the names of speakers or someone saying a verse, the parents’ names, or details about parts of the ceremony. Include names of the bride, groom and wedding party, date, place, time, the order of the ceremony (including songs and musical performers) and most importantly, a thank-you to guests and family who have made the day special. “Keep it nice and short—people don’t need a whole novel. Then they can concentrate on the ceremony,” Lim advises. Novels of information are unnecessary for your program, although don’t let this stop you from preparing an organized schedule of the day’s events. Don’t leave printing your programs until the week before the big day. Most companies request your template one or two months in advance, leaving time for any mishaps or complications. Be sure to proofread! Don’t be afraid to get creative and wow your guests with a cute and clever program. “Some couples have a timeline of the whole wedding day, not just the ceremony. Others have the day in history for fun. And some include short poems, Bible verses, love verses—things to personalize your wedding and make it unique,” Lim explains. As a rule, remember that simple is best (keep embellishments and fancy fonts to a minimum) when creating a memorable keepsake for guests.